Earlier this week, OnStage posted a review of Theatreworks New Milford's production of Bell, Book & Candle. In the review we noted how eerily similar the production resembled the 2012 production that ran at Hartford Stage and the Long Wharf Theatre. "I won't accuse the folks at Theatreworks of trying to recreate the Hartford Stage production. Who knows, maybe Bell, Book and Candle requires the same type of set, costuming, hair, blocking, etc in all of its productions. But if the script doesn't, then director/designer Joe Russo should be giving a lot of credit to Darko Tresnjak and Alexander Dodge for this production." After the review was posted, needless to say some people noticed it. One such person was Howard Sherman, former Executive Director of the American Theatre Wing and current director of the Arts Integrity Initiative at the New School for Drama. 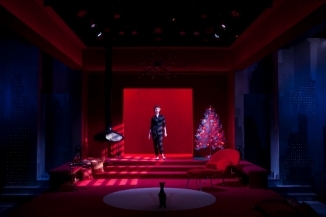 "There is no copyright protection for the work of directors (though the ethics of replication should be taken into account by all theatre artists), but designs can be copyrighted, and so the appropriation of Dodge’s work (created in collaboration with Tresnjak for his production) by TheatreWorks director and designer Joseph Russo without permission has crossed a line." And if you think Hartford Stage Artistic Director Darko Tresnjak didn't notice, think again. Sherman spoke with Tresnjak who said, "he was “freaked out” upon discovering the remarkable similarities between his production of Bell, Book and Candle and the nearby production in New Milford." In response to the fallout from having two nationally read blogs call out this production for basically plagiarizing another, Theatreworks New Milford first released a poorly worded statement, then deleted it and then decided to cancel the production entirely. While closing the production was the right move, it's unfortunate that the cast, who likely had nothing to do with this creative decision(yet some were told this was the director's intention from the beginning, sources say), are the only ones being punished for this. But Theatreworks New Milford has a bigger problem to address. As obvious and unethical as this example of copying another production was, it's astonishingly just the latest case when it comes to their productions involving Joe Russo. Back in 2013, Russo directed a production of Boeing, Boeing at New Milford. 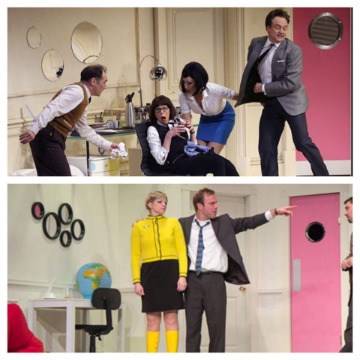 If you notice the picture on the left, the Theatreworks New Milford production(Bottom) shares a striking resemblance to the Broadway production(Top). While I can certainly forgive the color scheme because it matches the airlines the women work for, the set is pretty much identical. Theatreworks New Milford have seemed to have acknowledged this because as I'm writing this column, they're busy deleting their photo archives of their previous seasons. But there's more. Last year, they produced Nicky Silver's The Lyons. Again, a somewhat obscure production to choose, but it had been on Broadway the year before. Here is a pic of both the Broadway(Right) and Theatreworks New Milford(Left) productions. You'll also notice the near identical costume work on the female character. Who was the costume designer for this show? Joe Russo. 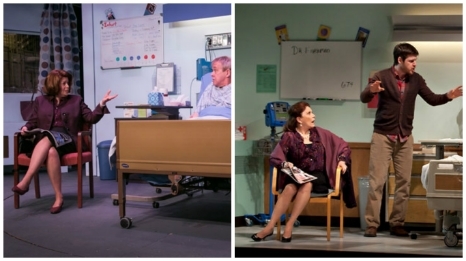 With these three instances, you have to wonder, what were Joe Russo and Theatreworks New Milford thinking? Did they think that copying other productions that were performed either on Broadway or other theatres within their own region, wouldn't be noticed? While this shows repeated errors in judgement on the part of Mr. Russo, it shows terrible oversight and creative control on the part of Theatreworks New Milford. To either not notice or allow this to happen repeatedly in your house and sully your reputation, is bewildering. To add insult to injury, just the other day they announced their new season where Mr. Russo is directing yet again. This time with the rarely done Tennessee Williams piece, The Milk Train Doesn't Stop Here Anymore, but I should note, was revived on Off-Broadway in 2011 with the Roundabout Theatre Company. My advice is to either change the show or take Mr. Russo off the project. The unfortunate truth is that Theatreworks New Milford aren't the only theatres that are doing this either. I've seen countless times of where productions have copied other renditions of the show by other theatres. While not necessarily illegal, it's always unethical. What's worse is that there's never a reason for it. Nothing would have been diminished about Bell, Book and Candle by not copying the Hartford Stage.Long Wharf Production. So why make such a lazy decision that only puts your cast and theater at risk? Since there isn't a law against this sort of practice, with the exception of copyright on design, it will only end when theaters are called out for doing it. So if you see instances of this happening, I can only encourage you to say something about it. The national shellacking that Theatreworks New Milford is going to take for this, is only beginning. The sad truth is that this could have all been avoided if someone simply said something before the show opened, or at least Googled previous images of the show.